The entire Waltrich clan including mom and dad, Paul and Margaret Anne, with their 15 children and 48 grandchildren, on a summer day at their Hatboro home. 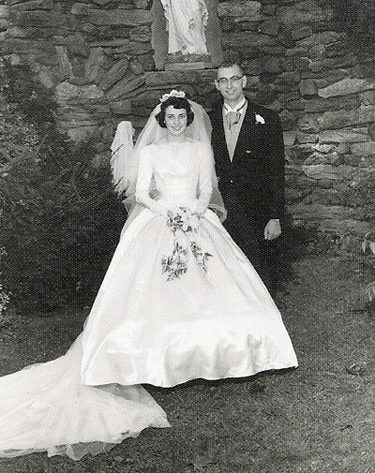 Paul and Margaret Anne Waltrich on their wedding day in 1960 at St. Athanasius Church in West Oak Lane. If you are thinking of inviting Paul and Margaret Anne Waltrich over for a barbecue and suggesting they bring the family, you’ll need a very big yard. Paul and Margaret Anne have 15 kids: Paul Jr., Celestine, Nancy, Theresa, Christopher, Michael, Amy, Katrina, Denis, Thomas, Stephen, Gregory, Francis, Elizabeth and Maryanne. But of course because they are all adults ranging from 53 years to 33 years in age, most of them have spouses, and you would have to make room for the 48 grandchildren too. Paul was original from St. Luke Parish in Glenside, while Margaret Anne Noonan was from St. Athanasius in Philadelphia’s West Oak Lane section, and that’s where they married almost 55 years ago. They honeymooned in Bermuda, but that was the last distant vacation they would have for quite some time. Neither was from a large family, but from the very beginning they were open to the idea. Paul has a degree in engineering and a career mostly at Stokes Vacuum Inc., an industrial vacuum equipment firm, before retirement. Margaret Anne was a secretary. “I stopped working when we got married,” she said. What she really means is she stopped collecting a salary; raising 15 active kids is definitely work. The family settled in a big five-bedroom house in Upper Moreland — more than adequate for most families but in this case “there were a lot of bunk beds,” Margaret Anne said. All were born at Holy Redeemer Hospital and none were twins – identical, fraternal or Irish (born within a 12-month span). Fourteen of them went to St. John Bosco School, Hatboro, and then on to Archbishop Wood High School in Warminster, followed by college. Katrina, their middle child, did not because she has Down syndrome and needed special education. Yes, as a special needs child she required more attention, but the family pulled together with the older children spoiling her and the younger children as playmates. Everybody chipped in. One of Paul’s tasks was to prepare the school lunches, no small matter considering for a time there were seven kids at once at St. John Bosco. Between lulls on Sunday football games he would make the sandwiches, and put them in the freezer to be doled out during the week. The kids were all active in school sports and clubs; some of the girls helped out in the rectory, boys volunteered in the school. St. John Bosco no longer has a school but at this time there are eight grandchildren at Wood with seven already graduated. In fact almost all the children live with 15 or 20 minutes of their parents’ home with the most far away living in Cinnaminson, New Jersey. Frank still lectors at St. John’s, and in past years he and Margaret Anne conducted Pre-Jordan and Pre-Cana sessions (prep programs for baptism and marriage, respectively) and also participated in RCIA, CYO and CCD for the mentally challenged. They stopped when the friends of their children began coming to Pre-Cana because it seemed too personal. Margaret Anne is still a daily Mass attendee at St. John’s, and often as not, when the children are away on vacation they are apt to bring back the church bulletins from where they worshipped. Back when they were growing up family vacations tended to be close to home, maybe down the shore, up the mountains or to amusement parks. The family just had one station wagon, and in those days before mandatory seat belts and other regulations the kids would just pile in with the little ones sitting on the laps of the bigger ones. For Paul and Margaret Anne the biggest challenge of such a large family was not financial or physical. It was spending as much time as possible with each child. Because there were so many, the children naturally divided themselves into age groups and they learned to share, and they became a support group for each other. Through helping Katrina, their parents believe, they learned compassion, tolerance, empathy and humility. As adults they still enjoy each other’s company and three — Amy, Theresa and Maryanne — are neighbors on the same street. With such a huge three-generational family there is always something to celebrate — somebody’s birthday, somebody’s graduation, somebody’s First Communion. Margaret Anne attended one, Paul attended another. Elizabeth (Beth), who was the godmother for the third child and still living at home, represented her parents at that celebration. Beth is also one of several children in the family who chose a career in Catholic education. If at times as a child Greg thought his parents overreacted to a situation, he now realizes as a father himself they were spot on and did just as he would do today. No, they didn’t often go to restaurants or even order out for pizza, but they never knew what it was like not to have a friend or ever be bored. And to this day, nothing makes their parents happier than when the whole family is together. “They made many sacrifices in order to raise such a large family and yet we never felt like we missed anything,” Celestine said. He marvels how they all made it out of the house every day with a packed lunch and clean clothing, and the loving environment of their home.